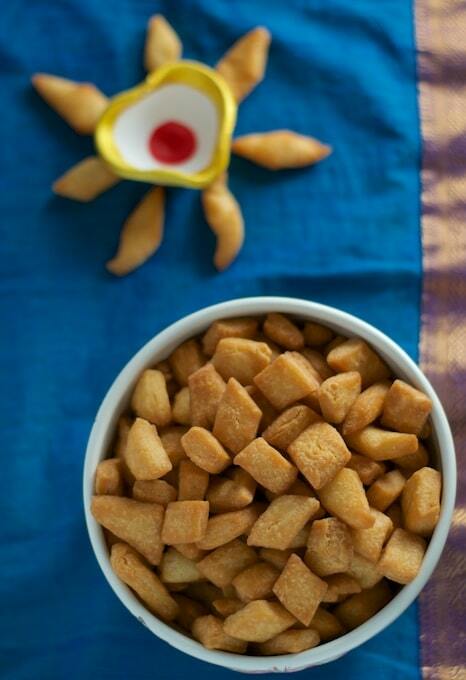 Shakarpara or Shankarpali is an extremely addictive snack that often finds it way in our Diwali sweet platter. 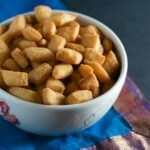 Learn how to prepare Shankarpali in 30 minutes! 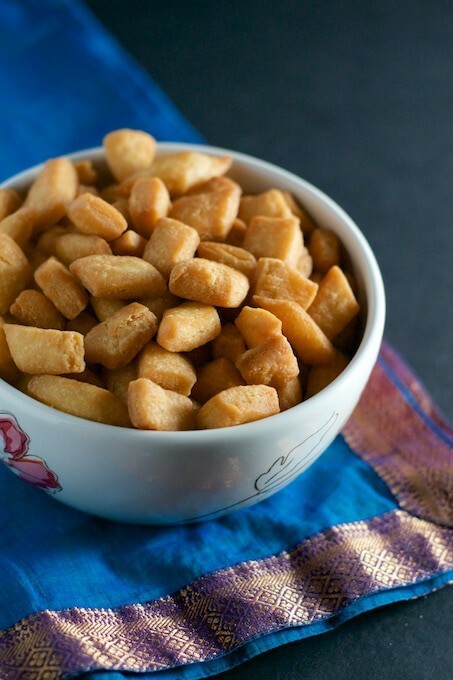 While Shakarpara or Shankarpali is traditionally made during Diwali, we are suckers for this snack and eat and make it pretty much throughout the year. There are numerous ways to make Shakarpara but this is my go-to recipe because it is so easy to make and also, it has a great shelf life because it does not contain milk. While I have made it several times, I never got a chance to post it because they disappear so quickly that we hardly have any remaining to photograph. Note of caution – It is an extremely addictive dish and reminds me of the Lays ad – “Ek baar khaoge to khaate reh jaaoge nobody can eat just one“. Keep a non stick kadhai and add water, oil and sugar and heat in low flame till sugar melts. Increase the heat to high and switch off the gas when the mixture starts to boil. Let the mixture cool down for a bit (~ approximately 2-3 minutes). Make 2-3 balls and work on one dough ball at a time. Roll the dough to a circle (approximately 7-8 inches) and 1/2 inch in thickness. Use a little flour while rolling to avoid sticking. Rolling on wax paper also makes it easier. Cut the rolled-out dough into desired shapes square or diamond (traditionally they are cut into diamond shapes). Heat oil to medium heat and when the oil is hot enough,deep fry these cut pieces in small batches till they are golden brown from both sides. Drain and remove them on an absorbent paper to drain off the excess oil. Let them completely cool off before storing it in an airtight container. I tried this recipe today and was delighted by the results. Perfect measurements and great result. Can’t stop eating these. add me to ur mailing list . thank you. Hi Deepa – you can use ghee if you would like but if you meant a healthier substitute then I am sorry, I don’t have any.